Bakery owners and managers in Northern Nigeria have decried that about 50 percent of bakeries in the region have shut down due to their inability to cope with high cost of production resulting from economic meltdown the country is currently faced with. They said the remaining bakers have also been forced to layoff 50 percent of their staff while quality may be compromised if the situation does not improve within reasonable time. President, Association of Arewa Bakers, Alhaji Bashir Tahir who stated this in an interview with Daily Sun in Kaduna shortly after the test baking seminar in conjunction with Chinese firm over the weekend lamented that, the basic ingredient which is flour has skyrocketed from #6,000 to #11,000 while sugar and butter have also inconveniently been jacked up from #7,000 to #20,000 and #3,800 to #10,000 respectively. He said, “it is not an easy task for us to continue with the business especially with the economic recession the country is faced with presently. The key ingredient is flour which we were buying at the rate of #6,000 about a year ago but now sold at #11,000. Sugar before was #7,000 but now 20,000 while butter which was hitherto #3,800 is now #10,000 plus. “If I want to tell you the truth, that high in price of baking ingredients is affecting the quality of final output. 50 percent of bakeries have close down because they cannot cope while some have laid off more than 50 percent of their workforce. Before now, I have 150 staff but now I have to reduce them to 70. This is because we could not cope with current economic reality. “You cannot just high your price to make profit because consumers are not ready to accept that. If you produce at best quality, you cannot make any profit. You have to lower the quality that is, if at all, your consumers will accept the product”, he explained. On the seminar he said, “it is against the backdrop I told you earlier that we think we need to seek other technique and strategy to do it better which is why brought Angel Yeast Company from China to come and share with us their experience and see if there is what we need to do better to improve the living of everyone along the value chain”. 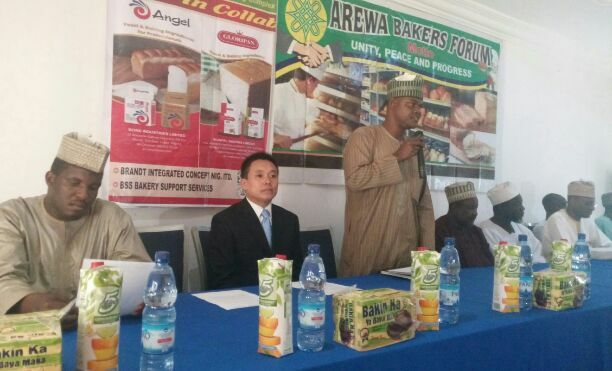 Earlier, area Manager, Nigeria, Angel Yeast Company Limited, Mr. Tony Chen said, the mission of his company was to develop biotechnology and innovate healthy live with introduction of various baking ingredients to ease Nigerian citizens the pains of current economic recession. Meanwhile, Kaduna State Coordinator, National Agency for Food and Drug Administration and Control (NAFDAC), Dadi Nantim Mullah, warned bakers in the region to avoid adding any substance not approved by the regulatory agencies to their products, vowing that the agency will continue it’s routine checks on shelves and anyone found culpable will be prosecuted. “It gladdens our heart that you are bringing your members together to ensure safe bread for our people in Northern Nigeria. We want to be sure that facilities are standard and products don’t carry substances that is not required by consumers’ system. Don’t add potassium bromate because you will be sanctioned once you are caught”, he warned. The seminar had in attendance participants from Kaduna, Yobe, Borno, Plateau, Abuja, Niger, Jigawa and Bauchi States.